What about a dark/NEET theme? Might be useful for some vampires in the dark, seeing mostly everything here is light and bright. again, involves redrawing some of these images, but random/I will get to it eventually. I wouldn't mind to just have more color controls for the memeland. Maybe we could make our potato colors for the memeland and we can have gameshark codes for our color combo to put in the Air Field in the Base, that way you can share it with other smilesorcerers. What about a dark/night theme? Might be useful for some users in the dark, seeing mostly everything here is light and bright. Just wanted to repeat the request for the [youtube] tag in case it wasn't seen/noticed. The difference is that ours looks bad and theirs looks good lol. Oh and shadow-edge darkness. IDK, other than the general look, Lumage is right. The layout is about the same; really they just have more features than we do. Some of these features are relatively easy, but others are... ugh lol. I have a set of things I want to focus on before taking on new requests, but I'll keep these in mind. It WOULD be nice to be able to pick multiple things in a poll, but it's kind of hard to implement in our current system. @CodeTrooper That's just part of trying to support mobile and desktop at the same time. If I can come up with a way to spread it out, I will, but spreading out the text from left to right just means you have to look harder to find the information you want. 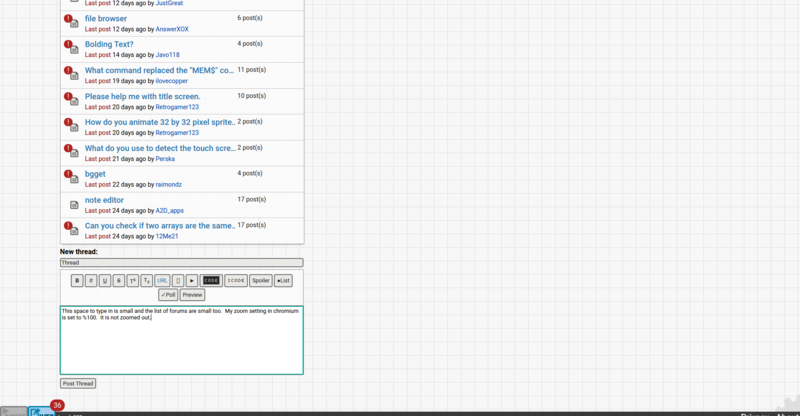 Maybe I can put something over on the right, or make the thread list slightly bigger. Ah, I see. Maybe instead of spreading out the text maybe center the text? Maybe... but what about the "popular threads" list on the right? Maybe center the posts more towards the left and put the posts on the right. Also, it could help a lot if you used the screen width to center stuff, like auto-resizing. ...you... might want to look about a bit more so you know what you're actually asking. Now that our submissions page is starting to get quite big (truly an embarrassment of riches), it might be helpful to have another way of visualizing the program list. Right now each program takes up quite a lot of space, because of the thumbnail and description, and so not that many fit on one page. I find myself hunting through a lot of pages to find what I'm looking for. It might help to have a way of filtering by the program category tags that are used during submission, via a combo box or something. So that the submission list is better tailored to what someone is looking for. Oh, man, I'm simultaneously, elated and chagrined. Well played. How in the world did I miss that?